Toyota Highlander Hybrid combines stellar fuel economy with remarkable comfort and roominess. All in one gorgeous package. Explore new frontiers with freedom and confidence—and take your entire family along to share in the adventure. With a Hybrid Synergy Drive that generates up to 306 hybrid system net horsepower, and surprisingly wallet-friendly EPA-estimated 30 mpg city, Highlander Hybrid gives you the power, luxury and technology you crave—and the money-saving fuel economy you desire. Robust enough to tow up to 3,500 pounds, Toyota Highlander Hybrid features Electronic On-Demand AWD system with intelligence (AWD-i). That means you can drive with confidence, whether you’re heading through inclement weather, or venturing off-road. With seating for up to eight (seven for Limited and Limited Platinum trims) you get plenty of room to bring along the gang and all their gear. Independently ranked as top among a crowded field of midsize SUVs, Toyota Highlander Hybrid hits all the marks customers look for in a family-friendly vehicle; delivering style, roominess, power, and advanced technology to spare. It’s an inevitable fact of life that there’s more to owning a car than simply paying the sticker price and driving off into the sunset. To get a truer picture of the actual costs associated with not just owning—but also operating and maintaining—a vehicle it’s important to account for factors ranging from depreciation (all new vehicles decline in value somewhat the moment you take possession), to state taxes, rebates, insurance, financing, and anticipated repair and maintenance costs. Reliability—meaning the degree to which a given vehicle is likely to need repairs over time—is one factor that determines true cost of ownership. Anticipated resale value is another. Toyota vehicles invariably feature better than average reliability, and retain excellent resale value. According to independent assessments, Toyota Highlander Hybrid costs the least per mile to own and operate for five years, compared to its four closest competitor vehicles from other manufacturers. That’s an advantage you can bank on. Toyota Highlander Hybrid is available in four models. 2017 Highlander Hybrid LE: $36,270 MSRP. 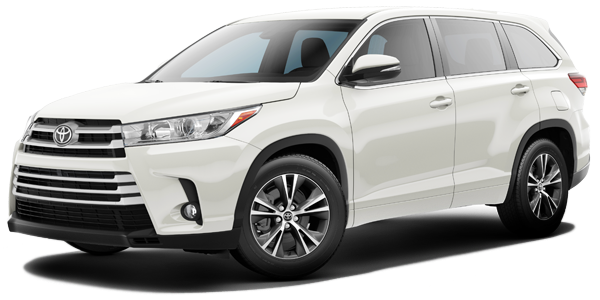 2017 Highlander Hybrid XLE: $41,330 MSRP. 2017 Highlander Hybrid Limited: $44,760 MSRP. 2017 Highlander Hybrid Limited Platinum: $47,880 MSRP.